The image shows an approximate relief of the European continent at the time of transitory societies. Their settlements were rather separated. 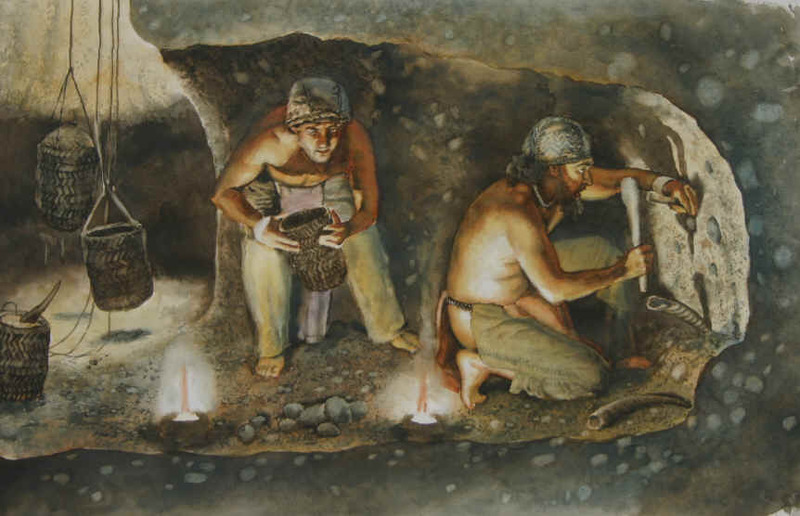 The transitory societies occured between the Middle and Upper Paleolithic. They involve Bohunicien and Szeletien era as well as the Aurignacien a Chatelperonien era. The original Neanderthals were gradually replaced by anatomically modern people. The transformation from the Middle to the Upper Paleolithe was not fluent. 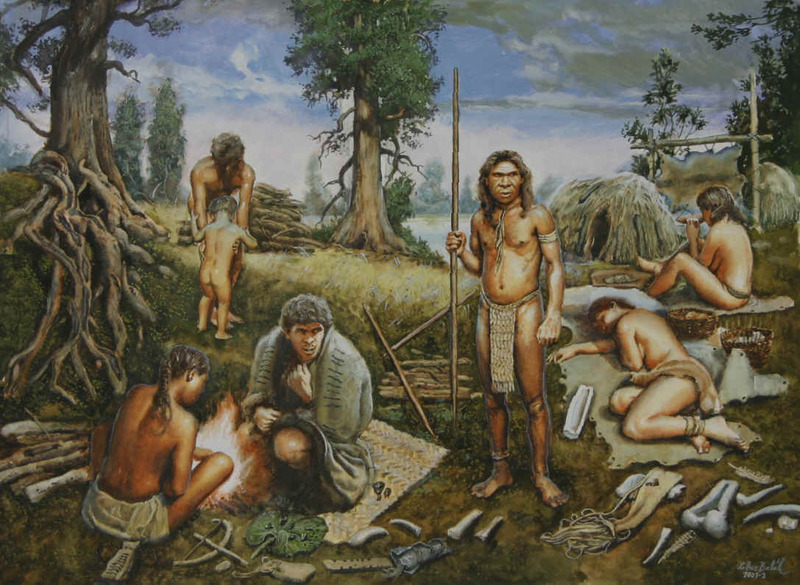 The groups of Neanderthals and hominids lived side by side on the whole European continent. Some of the cultures kept the tradition of the Middle Paleolithic technology of implements, which could have been used by the Neanderthals, but we are not sure about that. The features of the stone tools technology of chopping indicates, that the groups of hominids could have migrate to Moravia form the Near East. We suppose that these people were anatomically modern humans. The picture represents a Szeletien hunter carrying a bow and an arrow with a very small head, used as a projectile. The way of making the arrowheads resembles the way of making them in the Middle Paleolithic era. The man on the image is pictured as a Neanderthal. 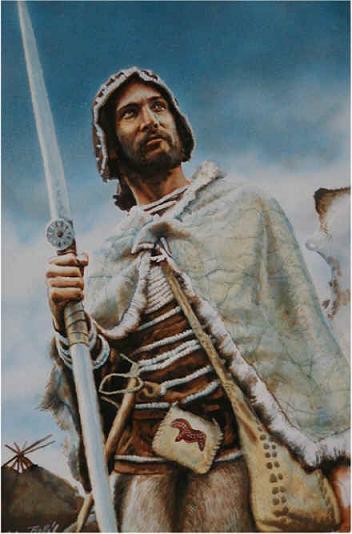 His clothing, weapons and haircut correspond with the technical and creative processing of the Sczeletien silicit arrowheads. Szeletien is a Middle Europe transitory culture, known especially for the construction of beautiful colourful Silicit projectile points. The material for the stone blades had been transported even for tens of kilometres. The Szeletiens blades evoke the traditional hand axes of the Middle Paleolithic era, which could indicate that the culture emanated from the traditional Neanderthals ethnics. The settlement strategy doesn´t overlap the Bohunicien settlement strategy. The Radiolarite blades shown on the picture come from the Moravany region in the West Slovakia. Some of the arrowheads are made by chopping of the stone and their thickness is ideal for penetrating the tissue. Therefore, a reconstructive metamorphosis can be made and make the arrows to a living weapon. The reconstruction goes from the harmonic connection of technical and creative technology of the arrow head, with a shaft of a very high quality. The shape of the arrowhead indicates, that the arrow must have had flight stabilizer to increase the possibility of hitting the hunted animal between the ribs. The size of some blade shows, that the shots have been of a very little weight and very small, so that simple throwing it by hand or by a thrower wouldn´t have the needed energy to hit the target. This energy can be achieved only with the bow-string. Bohunicien is a specific culture with advanced Levallois technique – method of lithic reduction, involving striking the flakes from a prepared core. The settlements were strategically placed on the hills around the dells of Brno, so that the early people could observe the movement of herd animals. The climate was colder than today. On the localities in Brno, the archaeologists found red and yellow pigments, hornblende and radiolarite. The most famous localities in Moravia are Bohunice, Stránská skála, Líšeň, Tvarožná, Želeč, Nižný hrabovec in the Slovakia, Dzierzislaw in Poland, Tulichivka in the Ukraine, Temnata in Bulgaria and Boker Tachtii in Izrael. This image represents the initiation rite of the boys. It is a first image reconstruction of the people of the transitory cultures. The picture was made for the municipality of the Brno city, with the help of consultants Miriam Fišáková Nývltová and Petr Škrdla. The thin flakes of the hornblende would be suitable as small projectile points for arrow or as a spear for the thrower. On some of the projectile points, we can see the small spots, where the lithic flake split after being hit by the point. The Bohuniciens points are made of hornblende and radiolarite. They look interesting and beautiful. Another reconstructive transformation supplemented by the Bohuniciens hornblende points (Stránská skála, Brno). Another reconstructive transformation supplemented by the Bohuniciens hornblende points (Bohunice - Brno).